For the third year in a row, I had the honor of representing the Air National Guard, the 124th Fighter Wing, and the great state of Idaho at the United States Air Force Marathon. 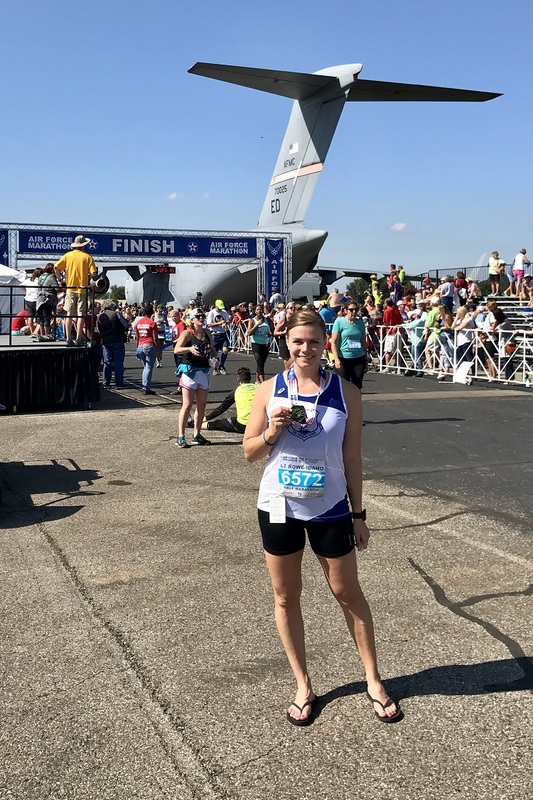 I was on the ANG team the last two years for the MAJCOM Challenge, and this year I traveled to the event as their team alternate (in case anyone was injured leading up to the race). To support this amazing group of super-human runners was just incredible, and to run the race alongside them as an individual was also a great experience. Luckily for them, as you'll read below, my time did not count toward the team time. It just wasn't my day for a good race—but we all have those—and the trip in itself far outweighed simply "having a bad race." To start, I didn't put my name in for the team this year for a couple of reasons, but the main factor being that since we are the only un-funded team in the entire MAJCOM Challenge, shilling $1,200 out-of-pocket to participate in this event was a bit of a stretch for me, my husband, and our financial goals this year. The second reason I didn't apply is that I'm nursing a fractured sesamoid bone injury in my foot, one that's been plaguing me off-and-on throughout my marathon training for the last two years. I had intended to give it some R&R, but clearly that didn't happen. The third reason I didn't apply was that I spent half the year in Texas for Security Forces training, and the rigors our bodies were put through down there didn't lead very well to long-distance running. I was stronger, sure, but definitely not faster. So I told the team I'd be an alternate this year and let an amazing gal from New York have my spot. She ended up being the only new addition to the team and absolutely killed her race. So all in all, it was a win! Now, I'm sure you're already asking yourself how I was able to go since $1,200 was going to hit my bank account hard, right? Well, a blessing came my way and I was completely blown away when our Idaho National Guard Officer's Association offered to sponsor my entire trip. Holy cow, what a gift—my prayers were answered! I literally would not have even been able to fathom going on this trip if it wasn't for them, so I was (and still am!) ever-so grateful for their support to send me to Ohio for this race, morale, and team-building event. I flew out to Dayton on Thursday, two days before the race, to help acclimatize to the Ohio humidity and avoid any last-minute stressful travels. I walked around the Wright Patterson AFB BX for a while, met one of my teammates at the Expo, and went to dinner with half the team at Texas Roadhouse. On Friday, I woke up and went for an easy 3-mile run around Wright Patterson AFB, and relaxed/stretched prior to heading to the USAF Marathon Expo to meet up with the team and pick up our race packets. After the Expo, we enjoyed the Gourmet Pasta Dinner, hosted at the National Museum of the United States Air Force. I love that dinner and their guest speakers... it's always one of the highlights of the trip. Saturday morning began early for us as we boarded the busses at 5:30 am to head to the race. Everyone seemed pretty nervous, though since I didn't have the pressure of competing with the team this year—but instead as an individual—I didn't feel my usual pre-race jitters. We arrived and set up camp in the MAJCOM tent, waiting for the race to start. 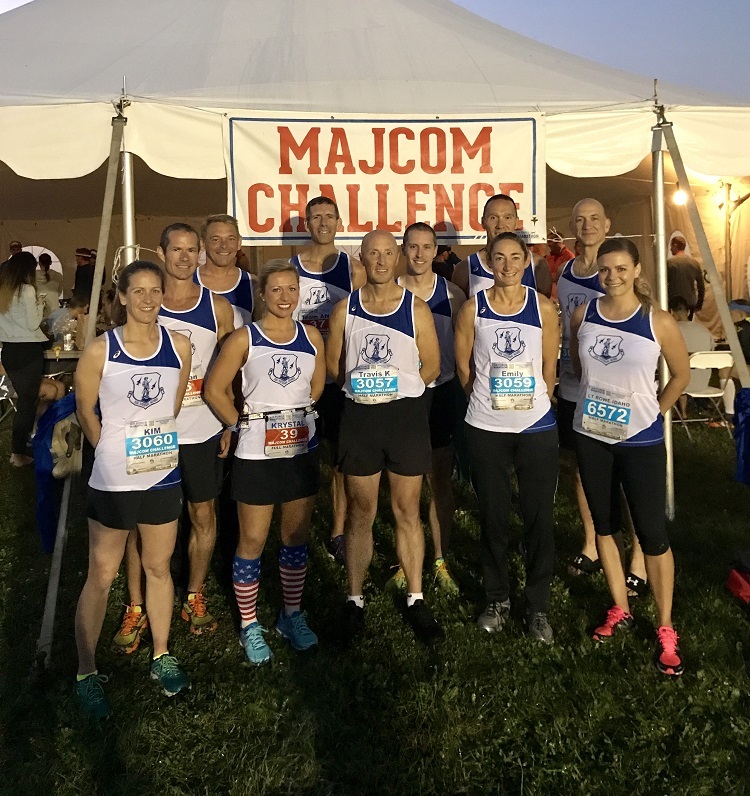 The Air National Guard MAJCOM Challenge team prior to the race. We had six half marathoners—2 females/4 males—and four full marathoners—1 female/3 males. I was the alternate juuuuust in case anything happened! F-22 & P-51 flyover to kick-off the race. At 7:30 am, our marathoners were off, and as half marathoners, we followed shortly behind with a start at 8:30 am. I began running with our Chief who organizes our team and we held a 7:45/mile pace for the first mile. Compared to the last couple years and my prior race paces between 6:00-7:00/miles, this didn't feel so bad. Again, my training was off this year due to SF training in Texas and my injury, so I wasn't really going for anything special with this race... I was just glad to be there to participate! It was a pretty muggy morning, but not too hot at the start, so I was able to maintain between 7:24-7:51/mile for the first 8-miles—I even stopped at the "free bacon!" table for a sampling, which I'd always been too afraid to do in years prior. Mile 9 hit me pretty hard as I crested the big hill on the course, sending my heart racing to an uncomfortable level. I lost feeling in my hands and got the chills and knew I was pretty close to passing out. It was then, for my first time in a race, that I had to walk. HOLY MOLY you guys—talk about a gut check there. I knew my heart was beating way too fast for my normal running state and it was all I could do to just walk it out without completely collapsing and pulling myself from the race. I was so bummed. The last four miles were MISERABLE, and I had to walk-jog the entire way just to make it across the finish line. I almost stopped at every medical tent I saw during the last four miles, but just couldn't bring myself to quit the race. I've never had such a rough race nor have struggled so much to eke out the last few miles. I mean, I was walking down the home stretch to the finish line (though I did muster enough strength to jog the last 100m or so). Oofda. I had nothing left. As I received my finisher medal and reflected on the race, I was not only glad that I was the alternate for our ANG team this year and that my time didn't count toward their time since I did so poorly, but heck, I was just glad I finished at all. After I recovered from the race and settled my heart rate back to normal, I cheered on the rest of my full marathon teammates as they finished their races. 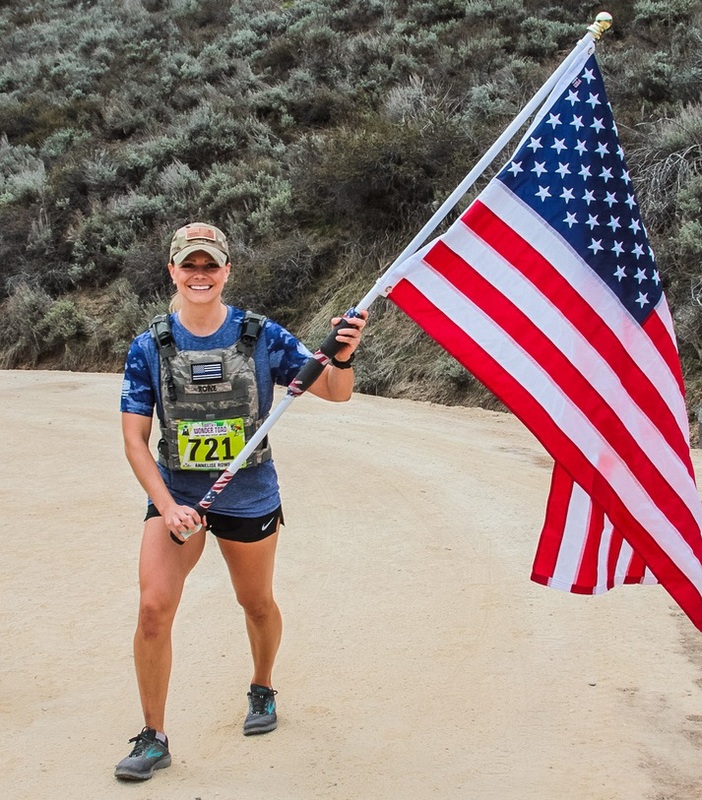 When all was said and done, one of our half marathon ladies won the 1st place overall female award and our full marathon gal won first place military female. One of our male marathoners also ran a PR, and almost all our other runners had stellar races. So exciting! Overall, the team was about 20 minutes slower than last year's team time, so we will have a competitive team time to compete against the other MAJCOMs. They should be releasing results later this year—so fingers crossed that we won! 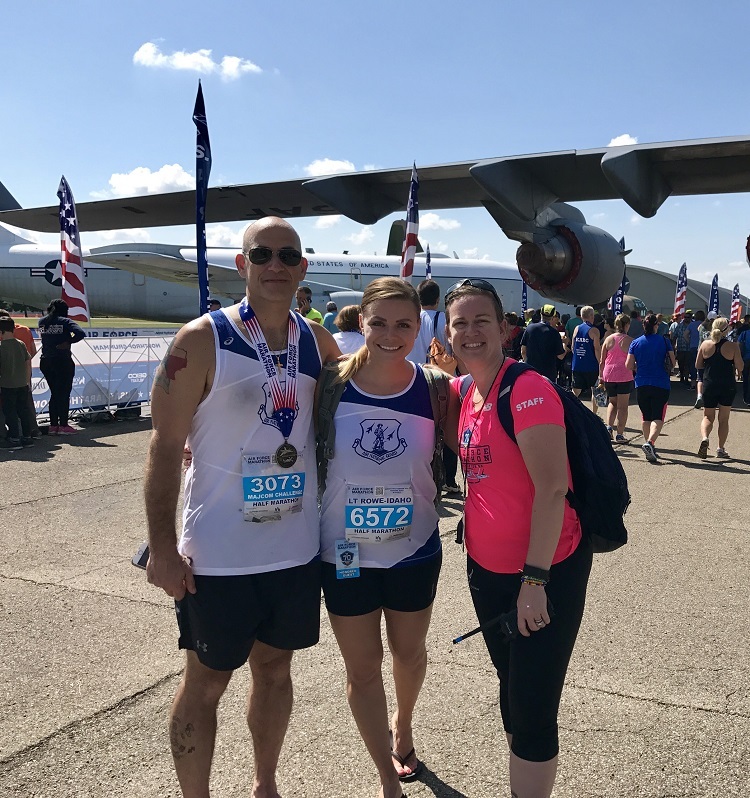 The Command Chief who organizes our race (left) and the MAJCOM Challenge team coordinator and USAF Marathon staff member extraordinaire, Rachael (right). These two are so supportive, uplifting and helpful, and have become very good friends over the last two years. After the race—and a nap of course—most of our team headed to the race's "After Party at the Greene" for some good British food at The Pub and live music. I was so excited to get to spend some time with one of my best buddies from Officer Training School, Nick, who I'd met two years prior at the 2015 MAJCOM Challenge when he was running for PACAF. I talked with him briefly at that race and immediately recognized him when I saw him at OTS last year. We ended up running 13-miles almost every Sunday at OTS, and got to know each other really well. This year, he came back to run for Global Strike, so we got to spend almost all day hanging out in the MAJCOM tent and then he joined us for dinner at The Greene. I tell you what, it was so good being able to catch back up with my old running friend! Well, I may not have had my best race, but it definitely wasn't my slowest ever. The entire experience in itself was pretty humbling—you're not going to win everything, right? In addition, the honor of being able to represent the Air National Guard, the 124th Fighter Wing, the state of Idaho, and to be the alternate support for this year's ANG team far outweighed the perks of bringing home any flashy trophy. This weekend was for team building, morale, fostering relationships, having fun, honoring service through fitness excellence, and a camaraderie that you can't really find anywhere else. So no, as everyone back home has been asking, I didn't win, but really? Yes... I did. Thank you again to the Idaho National Guard Officer's Association who sponsored this trip for me. I would not have been able to travel to this race or gain the personal/professional development I did without your support!